Wordless Wednesday – Any Ideas what this is? ‘Getting Them Young’ – Are We Doing it Wrong? For any hobby to survive, it needs new people coming in. But is the hobby as a whole missing something? Today Hornby has announced that it is stopping production of its Thomas & Friends™ range. Cue mass panic on the internet that the hobby will, no new people entering the hobby, etc., etc., etc…. 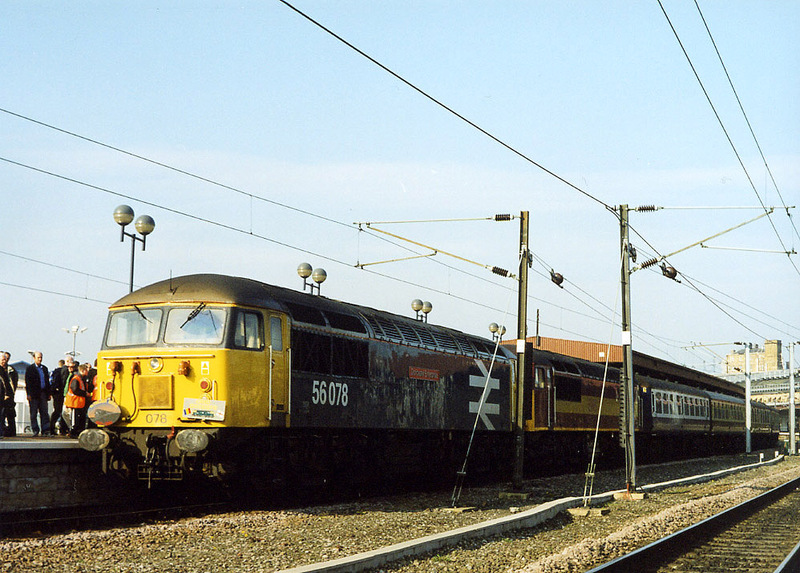 In fact, if you watch the recent programmes, you’ll see they have become far removed from railways as we know. Far removed from the stories the Reverend W. Awdry told. Far removed from reality in fact. I don’t doubt it could be the spark for some children to take a real interest in railways, but it’s not the only way, far from it. The end of Hornby’s Thomas The Tank Engine, now properly known as Thomas & Friends™, range. No doubt the cost of the license to allow the range to be produced, toy giant Mattel now own the rights. You only need to look at heritage railways where the number of ‘Days Out with Thomas’ has reduced enormously – there’s a reason why many are having Peppa Pig or Paw Patrol days now! For years we’ve heard people bang on and on about “getting young people interested” and while this does make some sense, it is very much flawed. Firstly, children lack the buying power to actually have any real influence on the hobby as far as I can see. The newcomers who have the money to spend which can make a difference are, I think, the thirty and forty some-things, who are either returning to the hobby or are making a start with it. They have the time and money to properly enjoy things. The increasing standard of ready made stock has no doubt done a lot to draw them in along with the massive leaps forward with the hobby in terms of control systems and scenic materials. No doubt the internet has helped things too – it is so easy to browse pretty much anything. Despite this key group, we still hear people saying we need to get children interested. On one level this is true, as many people are those returning to the hobby after years of cars, jobs/careers, families, etc. In order to return you must have been somewhere in the first place! Children will find the hobby a struggle on pocket money – those who are heavily or actively involved tend to be those like me, with a parent or close relation interested. So you help them, and they help fund your hobby! In essence anyway! But to really grab a child’s interest, are clubs and exhibitions getting it wrong? Plenty of shows have a ‘Thomas layout’, and for the most part, they’re terrible. Creations rushed in clubrooms so “there’s something for the kids” – from personal observations many are frustrating as the trains are not very controllable. They set off like performance cars and have no degree of control beyond very fast and stop. Little more than toys – and how many adults think that this crap will draw a child into a long term hobby? My son, Thomas, loves railways. For years he has loved running things on ‘grandpa’s layout’ – at home there are trains and books and the same is true at both sets of grandparents’ houses! 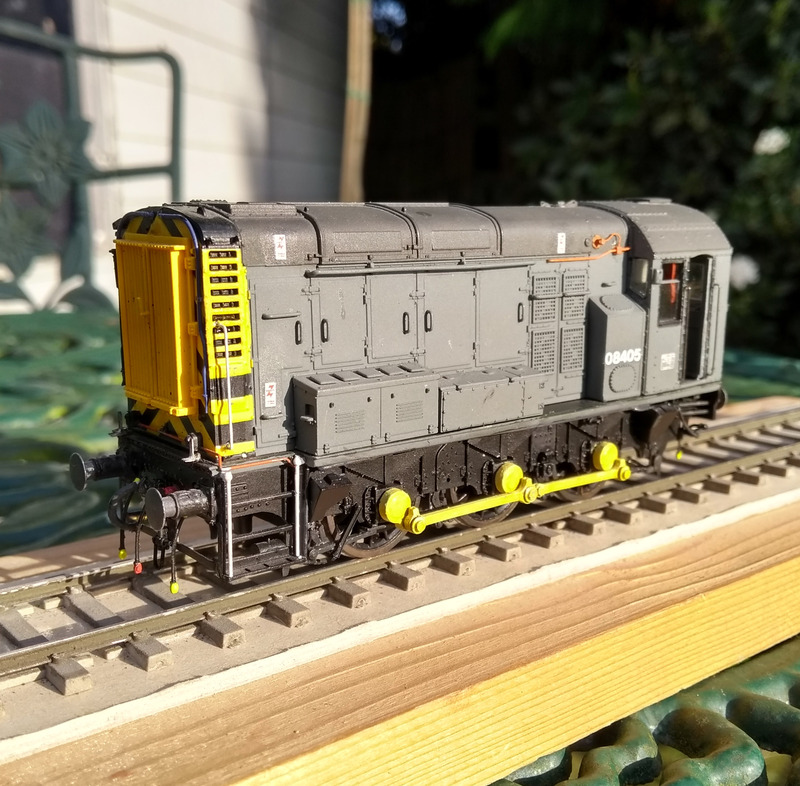 He’s helped Father in Law 2.0 at exhibitions, operating his layout and of course he has now turned to building his own models, only needing a little bit of help now and again as he works his way through various wagon kits. He has come to shows with us for a long time now. But it wasn’t the Thomas layouts he really took too – more likely was having a go with things like the Lego layout which appears at many northern shows (very good and far better than the Thomas layouts I’ve mentioned!). But one thing has stood out for me. It’s when he’s had a turn operating a ‘proper’ layout. Thomas, aged 5 years old, operating Colinton at Scalefour North in 2015. This picture was taken at Scalefour North in 2015. Not an obvious show for a child I admit, but this was repeated at Manchester that year too. He has been invited to have a go with a couple of layouts at shows – there was a delightful 3mm layout, Newfields Wharf, and Thomas saw an older boy, maybe eight or nine, shunting from the viewing side. So he said “I’d like a go!” I told him to ask the man if he could. So he politely asked and spent about fifteen minutes shunting! He got far more from this than the Thomas layout elsewhere in the show. Similarly at Warley a week before he had had a go with the Shelfie, Paul Marshall-Potter’s lovely minimalist layout. Experiences like this are great! 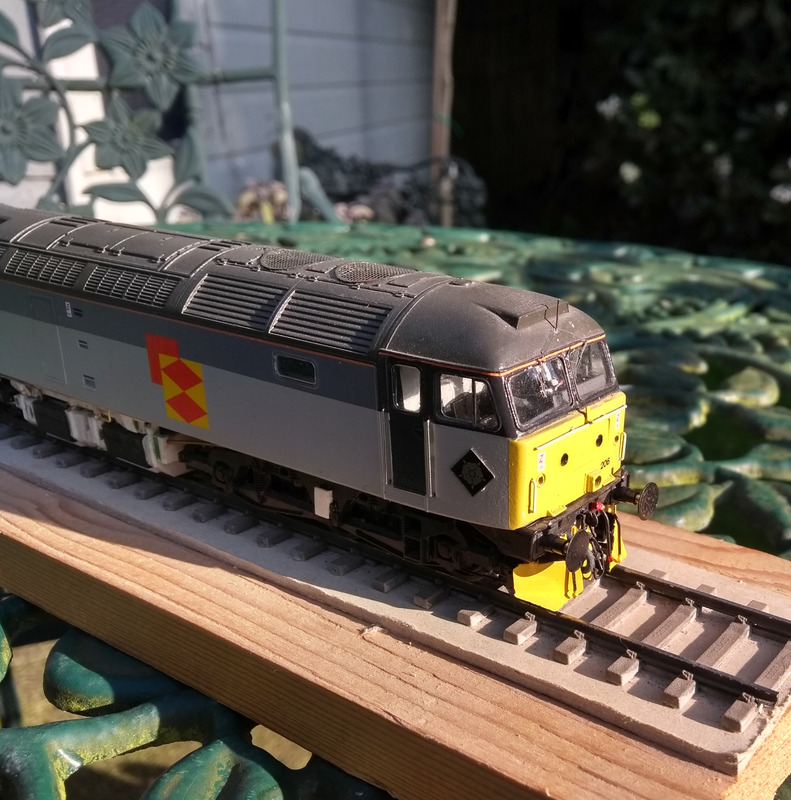 The key to these examples is that they were proper layouts which worked well and were built to a high standard with stock which worked very well. They were not collections of cast off track and equipment hurriedly assembled in a damp club room. Thomas, and any other child given the same opportunity, can see just how satisfying the hobby can be. I could see how much satisfaction he got from the experiences. And now at the recent Scalefour North he was getting excited by see Great Western branch lines! He’s taking quite mature approach to building things too. These mineral wagons would be considered to be good if they were the work of many adults. Of course this isn’t the only way to pursue the hobby but for our very much ‘doing’ end of the hobby, this is very important – the whole process of making things is key to our hobby I think. He still likes to play trains, of course – whether that’s operating ‘proper’ layouts of when the Playmobil railway takes over the living room! But it’s also helping him (and his sister!) to appreciate good modelling and to know and understand the time and effort which goes into it. Thomas’ first kit built wagons. Getting the young into the hobby is not just dependant on Thomas or making assumptions about what children want. We want to sell our amazing hobby as one which can be taken seriously and be satisfying, entertaining and sociable all at the same time. We owe it to the hobby to take new entrants of all ages seriously and not dumb down based on age and experience. Another lovely show in Wakefield put on by The Scalefour Society! Scalefour North is the northern show which the Society hosts – it must be one of the friendliest and most laid back shows you can attend. No barriers, so you can get up close and personal with the exhibits, or even the exhibitors too if you’re feeling brave! And what a lovely selection of layouts too. David Furmage’s new layout, Clackmannan Goods, was a delight and I was very pleased to see it finished too. There wasn’t a bad layout so if I don’t mention it, that’s no an indication that it wasn’t worth looking at! But I really enjoyed seeing Farringdon – I remember this vividly from Model Railway Journal No. 77 (the tenth anniversary issue) from 1995 – I can remembering buying this issue myself at the age of eleven or so. Perhaps not the average buyer but the quality drew me in. Thomas was really taken by this and Clutton too. 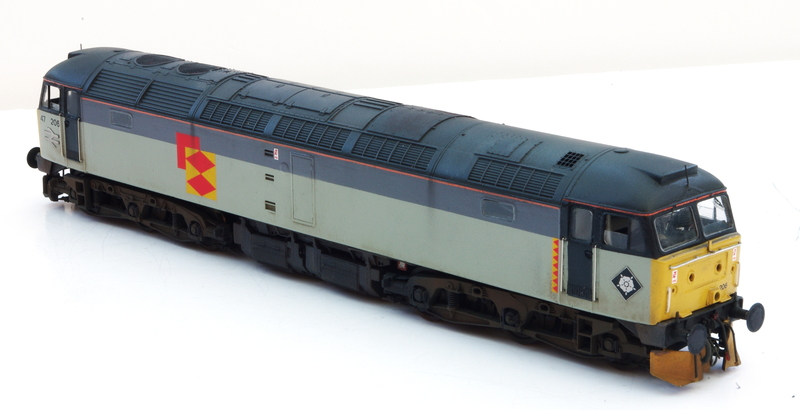 Both very good models of Grat Western branchlines – he has taken a liking to the GWR – I blame Father-in-Law 2.0 for this! The whole show was full of conversation and cracking modelling – easily one of the highlights of the modelling calendar for me. Picton by David Bywater & Geoff Allen. Picton by David Bywater & Geoff Allen – very much looking forward to see this develop! Wagons on David Furmage’s Clackmannan Goods. 2251 Class arriving at Farringdon. Forget what the miserable armchair types spout online, the Society is one of the friendliest and most welcoming societies I think you’ll find – if you model in 4mm scale to any standard, membership is well worth considering. Just a little update, the Lanarkshire buffers painted – personally I think they’re a great improvement. They’re not sprung, but unless you’re using three link couplings you don’t need this, but they look so much better! After being very pleased with how the Lanarkshire buffers looked on 08632 I became rather dissatisfied with how the Hornby buffers looked. Even in their raw, unpainted form the improvement is instant and you realise how undernourished the Hornby buffers are by comparison. And at £2.50 they are stupidly good value – beautifully cast and needing very minimal cleaning up. Superb, absolutely superb! Sutton’s Locomotive Workshop exciting new products! As soon as Sutton’s Locomotive Workshop announced the class 24, we all saw how lovely some of the individual components were. I really liked the Oleo buffers, and now Phil has decided to supply the separately! If you’re Scalefour North this weekend, have a look. Every year since I was three I have been to The York Show with my Dad, and for the last few years with the Boy too. Ferme Du Pont in 0-14, 7mm scale on 14mm gauge track. A lovely depiction of the WD railways on the Western Front in the First World War. The way the river and the bridges lead the eye into the scene is very effective. The height at which the layout was displayed was very pleasing, although just a touch too high for Thomas. One very good thing about York these days is how diverse the exhibits are. I find it frustrating when I read online when people dismiss layouts simply because it’s not what they model. It’s very small minded – there’s always the appeal of someone who is doing something which is close to your heart. Of course there is – we are all like this and three’s nothing wrong. But to see diesel modellers dismiss steam era layouts as simply “kettles” or steam modellers similarly disregarding diesel era layouts as being just “boxes on wheels”- both believing they are amusing in doing so more often than not – is just quite sad really. Frecclesham – 7mm scale in a relatively modest space. The backscene adds hugely to the whole effect of the model. It feels spacious and the scene has enormous depth to it. I’d like to do something like this with West Halton. I think there’s something to learn from viewing all sorts of different genres. I like Warley because there’s always something you admire which you’d probably not have considered beforehand. I like how the Boy always seems to find something non-mainstream at the big shows. At York he liked an 0 gauge French MPD! York was particularly diverse this year. This wide range of exhibits can be useful regardless of you own interests – never just focus on those layouts which are exactly as you model, open your mind to all you can see. Especially when the quality is high. Ripponden – N gauge but with hand built track using, I think, 2mm Finescale components. A lovely balance between the two standards it would seem. Ferme du Pont is a very niche subject but the presentation with a high track level and the use of the waterway and bridges, the whole presentation is suitable and an effective way to present a whole host of schemes. I think something like a subject such as Yates Duxbury & Sons’ Papermill, in Bury in Lancashire, where a like could be crossing between two paper mills over the River Roch? Well, the Yates like wasn’t quite like this, but you can easily imagine such a setting for an industrial line! So always keep an open mind, don’t be blinkered. Railway modellers can be surprisingly blinkered. Sometimes, even when the standard of model making is good, the setting of the model, the context, how it fits in with the real world, in society. I know full well that many out there don’t care, don’t understand this or are completely oblivious to this way of thinking. Plenty of modellers are quite ignorant about how the railway itself works, let alone anything beyond the railway boundary. Reading some contributions to some Facebook groups is just cringe worthy. Yet I think that an understanding of how the railway works and how it relates to its surroundings is the point when we cease to be grown adults playing with trains and become model makers creating something special. The hobby does, of course, take many forms. I love seeing the displays of things like Hornby Dublo or Tri-ang at shows. But whilst at first this really is old blokes with train sets, what these society displays really show are how the models and toys themselves have impacted upon the hobby. We’re seeing them in a context which gives it deeper meaning. American model railroaders seem much more au fait with given their layouts purpose – operation is always presented as a key part of the hobby in North America if you read something like Model Railroader. Industries are often used to give featured layouts a purpose, a reason for running trains. And even allows for trains to travel from one place to another, with a purpose, without entering hidden sidings. Of course in the UK we mostly don’t have large cellars or basements for a large empire but we can still learn from this. Even where we model just a ‘typical’ country station without a large industry, understanding the locality will provide sources of traffic within the goods yards. Certain areas may provide more arable produce than livestock or something very specific to the area. Getting a feel for the locality and the industries/local economy can really bring a layout to life. Hunslet stored at the National Coal Mining Museum. This is why museums such as the National Coal Mining Museum can be very useful for us. I went there the other day for the first time with my family. The museum offers underground tours of the colliery but you have to be five to participate and my little girl is only three. Plus she’s a little bit mental so being trapped in a confined space underground with her would require much bravery. Thomas Hill loco on display at the NCM. Museums like this are a wonderful resource, as well as a good family day out – the colliery themed adventure playground is worth a mention here too! It touches upon railways in terms of the exhibits, including the industrial narrow gauge usually found under ground, as well as displays about the role the railways played in transporting coal and allowing the industry to flourish. Combine this with the displays and exhibitions about the coal industry and the social side and you can see not only the role that railways played but also how the integrated and were integral with the industry’s development. And it’s not just the big museums like this – many little local museums, whilst bereft of full size exhibits, can contain many gems about their areas and associated industries. They open up fascinating opportunities to learn and further your own understanding – personally, I think this makes projects much more satisfying.